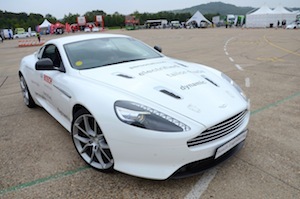 • Renewed confidence in UK’s ability to translate ideas into commercial products – ‘valley of death’ bridged! 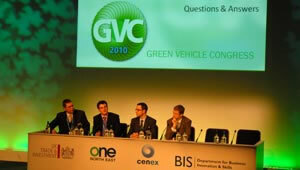 Cenex LCV has firmly established itself as the premier event of its type in the UK. For 2014 the tried and tested format of exhibitors, seminars, and drive opportunities was all present and correct and in larger numbers than ever before. If proof was needed of the diversity of low and reduced carbon options, the sight of an all-electric Magtec double decker bus and a McLaren P1 sharing the same piece of tarmac must surely be it. 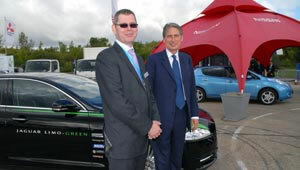 Is the car industry taking the low carbon agenda seriously? – absolutely. There is an increasing gap between the results from the official fuel consumption tests and real world driving, but the progress is still very impressive. 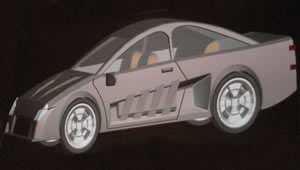 In 2004 the average new car emitted 171.4g/km CO2 and just 0.8% of cars emitted less than 130g/km. Fast forward to 2014 and the average new car is now emitting 128g/km and 63.3% of new cars are under 130g/km. How has this been achieved? Through legislation which has pushed manufacturers into unprecedented innovation. As a result the opportunities for lateral thinkers are boundless, however traditionally the UK has been very good at dreaming up technical solutions and very poor at getting them into production; the so-called ‘valley of death’. Many, many commentators have identified this issue over several decades but until recently nothing was really done to overcome it. Cenex LCV 2014 neatly demonstrated that finally the funding and the coordination is now in place to bridge the gap. 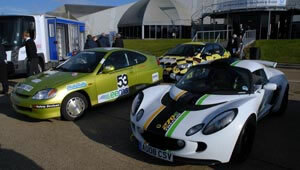 The Automotive Council is leading the charge and has already provided £205 million of funding to 190 projects through the Low Carbon Vehicle Innovation Platform. The latest initiative from the Advanced Propulsion Centre (APC) is looking to accelerate the development of some of the more innovative solutions and bring them to market. If you think that applies to your great concept then get in touch with the APC, which is backed by a £1 billion budget, guaranteed for 10 years. Then there is The Proving Factory which specialises in taking technology from concept to commercialisation i.e. proving the actual products. The undoubted commercial and environmental successes haven’t happened by accident. The automotive sector has built an excellent working relationship with government by demonstrating leadership and a record of delivering on promises. Several organisations have been central to this process including the Low Carbon Vehicle Partnership, Cenex, and the Automotive Council. Between them they have attracted funding and put forward credible pathways to deliver the low carbon transport that is desperately needed whilst enabling the manufacturers to remain profitable and deliver models that customers want. 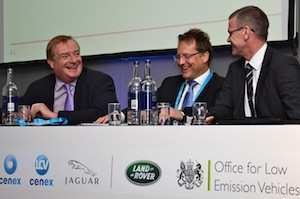 In response government funding has increased and the likes of the Technology Strategy Board and the Office for Low Emission Vehicles (OLEV) demonstrate the confidence that now exists. There was a clear message from both industry representatives and Baroness Kramer (Minister of State for Transport) that as long as low carbon vehicles keep on being brought to market and jobs keep on being created then government support will continue. With new initiatives to bring UK creativity to the fore, the next 10 years look very bright indeed. Are there any clouds on the horizon? Well, action needs to increase to address the poor air quality that many of our towns and cities face, but many of the solutions will also reduce CO2 emissions, so the two can be complementary. You! 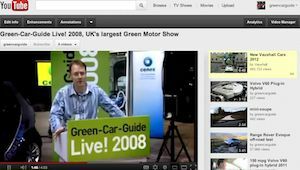 Vehicle buyers, and in particular car buyers, now have a massive range of low carbon vehicles available and this means lower running costs (better fuel consumption, lower taxation), less environmental damage, and more choice. 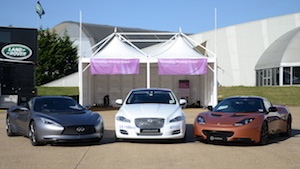 To illustrate the point there were over 80 ride and drive vehicles at LCV 2014 covering everything from city cars to supercars, there truly is a low carbon option for every buyer. If like us you believe that cars should be green and fun to drive then there is even better news as the new breed of low carbon cars are delivering on both counts. 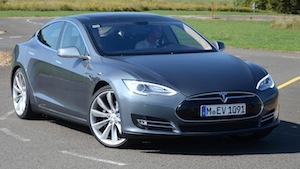 The all-electric Tesla Model S is seriously rapid, the plug-in hybrid Porsche Panamera is intriguing, and if you’re on a slightly more limited budget, the all-electric Renault Zoe combines nimble handling with chic looks. If you need more space and fancy some light off-road work, how about the plug-in hybrid Mitsubishi Outlander. Or if you want to see what the cutting-edge of ‘conventional’ design can deliver, look no further than the Jaguar XE, a 75mpg four-door saloon which demonstrates that advanced downsized diesel engines, intelligent design, and a lot of aluminium can deliver sub 100g/km CO2 emissions, Euro 6 compliance, and a seriously desirable package. There is however one company that consistently delivers, regardless of power source; petrol, diesel, electric, hybrid – this company is consistently class-leading in both CO2 emissions and driver involvement. Stand up and take a bow BMW. The electric i3 is our favourite ‘affordable’ electric car and putting the outlandish (looks and price!) McLaren P1 to one side, there was one car that turned more heads than the rest put together. The BMW i8 is the new hero and gives all car lovers renewed faith that there is absolutely nothing to fear from the brave new low carbon world. 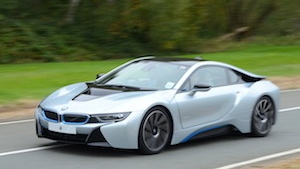 To find out why read our BMW i8 review here.